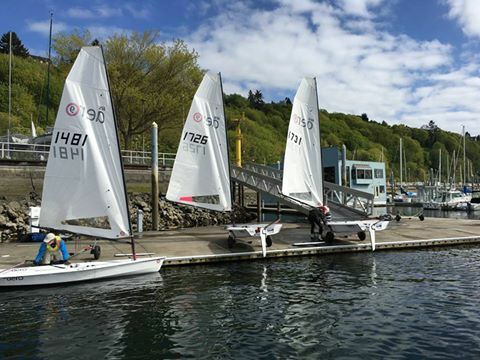 Thanks to Jacques Garrigues for his report on the weekend's racing in Seattle - they had 11 races! *Jacques commutes for his racing by motor boat across Puget Sound, towing his RS Aero behind! A funny thing happened to me last Saturday as I got in my motor boat to travel across Puget Sound to the RS Aero regatta when all of a sudden over the stereo comes Peter Barton introducing the party for 7 new Aeros at Lymington!!! I said “what is that?” My phone was blue toothed to the stereo and I was expecting Eric Clapton - but instead it was Aero News on Facebook! Maybe I am being tracked by RS ??? The PSSR event was a challenging first regatta. Top Tasar sailor Michael Karas was sailing our loaner Aero and is a terrific talent. The Seattle Aero fleet has some of the very best sailors and now Jonathan McKee will join us for Thursday night sailing too, together with class acts like Dalton Bergan, Carl Buchan and Dan Falk. Saturday was raining, the breeze was 5-7 kts early and built to 9-14 kts from the south running against a strong flood tide. On Sunday thank goodness the rain was gone and the breeze had switched to a northerly, 8-10 its early, building to 15-24 kts late. We had 3 very experienced new additions in Jonathan McKee, Jim Barrett, and Michael Karas all of whom were fast from the first horn. The regatta though was dominated by Dalton Bergan who has phenomenal speed upwind, downwind, 9 rig, 7 rig, you name it he is showing the other Seattle Aero sailors how it is done. Congratulations to him. As usual, other consistent performers were Todd Willsie (2nd) and Eric Becker (3rd) despite some “kissing” by them at the leeward mark followed by a swim to cool off!! The swimmer will remain nameless. We were on the water for ~4 hours each day with full on hiking and gathered at the end for well earned drinks and food. All in all a really good start to the season for our very competitive and growing Seattle Aero fleet. Next up in the Pacific Northwest is the Seattle RS Aero Demo Day on May 12th. Check out details and the full North American RS Aero Events List here.